We don’t make money off of conversions you sell yourself; you keep all the profits! Our first adventure conversion is ‘B4 The Lost Temple’. When you download this from the DMs Guild you’ll also get the source files to create your own products. It’s a pay-what-you-want product (you can get it for $0.00 if you prefer). If you can do the interior content, we can help you with the cover. These are conversion guides, not completely converted adventures. You should still need the original module to run these adventures. Completely converting an adventure (rewriting each scene) is likely not possible without further conversation or licensing from WOTC. What we’re doing is converting magic items, monsters, traps, and other key statistics, and giving some notes on running the adventure. If you have ideas about extra encounters or other changes to the adventure, put them in a separate section, maybe called “Extending the Adventures” or “Alternate Adventure Ideas’ but have the core conversion notes be such that DMs can run the adventure as it was originally written, but in the Forgotten Realms. For more information, please review our FAQ. as well as the guidelines from Wizards of the Coast on module conversion. Find a B/X or 1e era classic D&D module that you want to convert. The module must be one that WOTC still has rights to. Search www.dndclassics.com — if its for sale then they still have rights. You can buy PDF copies on www.dndclassics.com or a hard copies on www.ebay.com. Check our modules conversion list to make sure the module is not already converted or reserved for conversion. Contact us at stanshinn@gmail.com and let use know you want to create a conversion. We’ll announce that this conversion is in the works and you get ‘dibs’ on the conversion for 3 months. If you don’t finish the conversion after that time we’ll re-release the module as available for others to convert. You can reserve up to 3 modules at one time. We only want one conversion per module. Each module can have one or more Resource Kits (maps and such that the community creates and puts up for sale on the DMs Guild). Download our free conversion guide (we will update this soon and provide source file, likely as part of an updated B4 template .ZIP file). Download the template conversion of ‘B4: The Lost City‘ from DMs Guild.com’. Note the source files in the ZIP file in OpenOffice/LibreOffice format (the latter software is free and easy to use). Download the free font Andada from http://www.1001fonts.com/andada-font.html. Join our Google+ group where we talk about conversions and help each other with advice. After you create your conversion we’ll help you create the cover (we can even do it for you) and create the final PDF with embedded fonts. Conversions should follow the template format so that we create a consistently between products, even though the products are owned by different people. 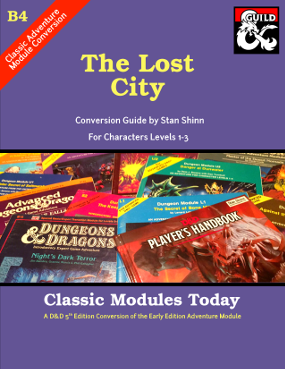 You then put it up for sale on www.dmsguild.com under the name ‘Classic Modules Today: <Module Number><Module Name>’, for example ‘Classic Modules Today: B4 The Lost City (5e)’. Make sure to put (5e) after the name to help people find it when they search for 5e products. For pricing, charge$1.95 to $2.95 based on the size of your conversion (modules range from 30 to 60 pages, so generally the longer modules conversion guides would cost more) . I have the B4 The Lost City module as ‘Pay What You Want’ but that’s simply to make sure you can easily acces the example template at low or no cost. After its live on the DMs Guild, we’ll then list your conversion on our site along with notes about the original module, giving you free marketing. 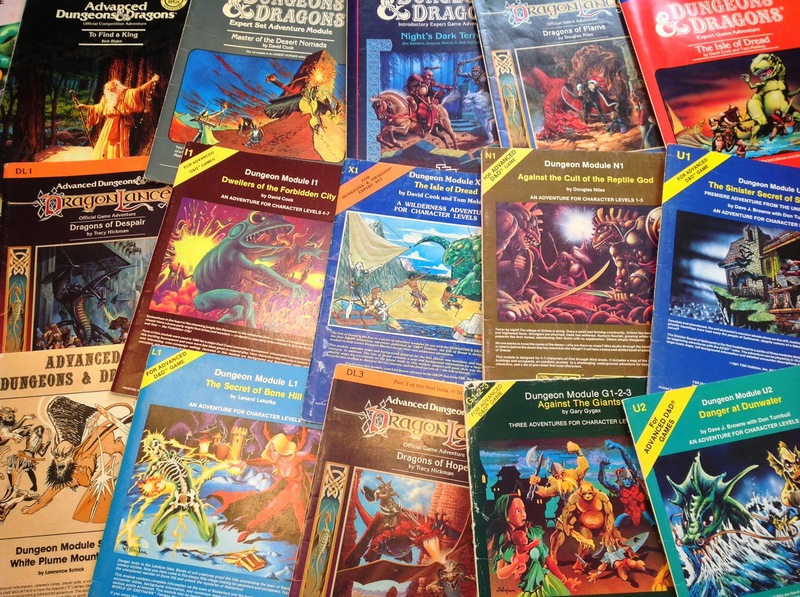 Over time we want to convert most if not all of the classic D&D modules. We love these adventures and want all of them readily accessible for people who play 5e but want to run classic adventures!